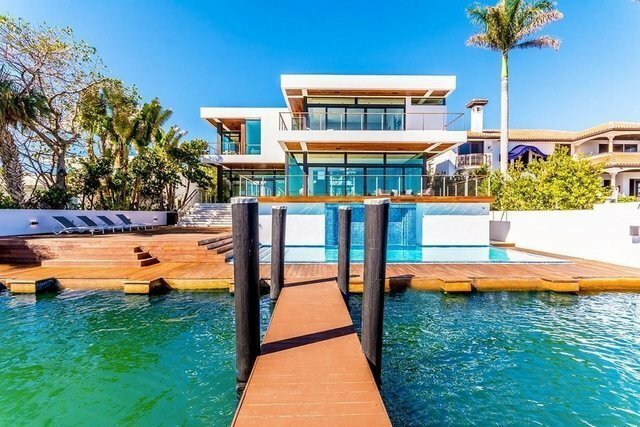 BRAND NEW MODERN VILLA PERCHED ON 75 FEET OF WATERFRONT WITH PANORAMIC BAY VIEWS SPANNING MIAMI BEACH ALL THE WAY TO DOWNTOWN MIAMI! Perfect for Families with 7 Bedrooms + 6.5 Bathrooms + Den encompassing 7,171 sq ft of Living Space. Waterfront Master Suite with top-of-the-line Bathroom Finishes and Closets. The Finest Finishes in Belle Meade sitting in a quiet Cul de Sac. Enter to an Open Floorplan with Soaring 22 foot high Ceilings wrapped in glass & Italian Cotto DEste 36x108 porcelain tile Floors and frameless White Oak Doors throughout. Home is equipped with Smart Home by Savant & ADT Security System. Custom TOGU Kitchen with Miele Appliances. Negative-Edge Pool with cascading Waterfall & private Dock for 60' boat. Please contact me for more info at dora@dorapuig.com or 305.613.2118.